Over the past couple of years Caryn and I have heard about countless art shows in this mysterious place called Chinatown. We’ve attempted to go to many of them, but much like the opening last night that we wanted to see, after driving around for 30+ minutes and not being able to find anything, we’ give up. This is pretty uncharacteristic, because I can pretty much find anything. Give me an address and I’m there, and in fact the framer that we use all the time is in Chinatown and we have no problem finding him. The difference is, he’s on Broadway. A real street, with real signs, that you can drive to. The galleries I was talking about, aren’t. Most of them are on some street called “Chung King Road” which I guess you can’t drive to? But there’s no signs, so much like the treasure cave from Pirates of the Carribean if you don’t already know where it is you will never find it. We gave up long ago of trying to track down “Chung King” but last night seemed more reasonable. The gallery has a street address, 510 Bernard, and when I mapquested it, looked easy to find. From all the maps I looked at, Bernard was one block long, and 510 was supposed to be right in the middle. So we drive over, find Bernard, and the addresses on the one block street range from 400-490. Once again, I’m looking for 510, and the street is only one block long. Yeah. So we drive back ad forth, and around the block several times before giving up. On the way out, we decide to try and hit it from the other direction just to see if there’s something we missed. A few blocks over we see a street sign for “Bernard” Bingo! Except… there’s no street. No Alley. Not even a sidewalk. Just a sign that leads no where. That was it. We threw in the towel and went home. So, my request for the day is this – I want either A. Someone who knows Chinatown like the back of their hand to draw up a map and put it online that explains what the crap is going on with all the secret hidden streets, or B. Anyone who is in Chinatown at one of those places and wants people to come to their location needs to include directions with their address. Say something like “You’ll need to park on this block, walk 10 paces north, turn east at this store, etc…” because just listing a street address, for a street people can’t get to isn’t working out so well. The first time you go there, it is confusing. 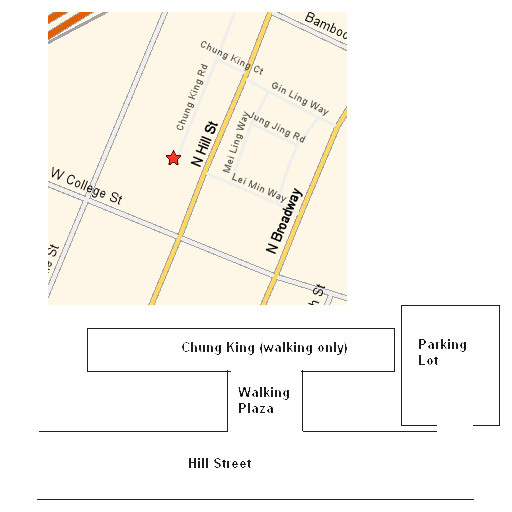 To get to Chung King Road, you need to park on Hill or in the nearby parking lot and walk into the plaza and you will see the street. You cannot drive on it. There are several galleries there. Next time you guys want to go to Chung King Road, let me know. I’ll take you. I wander around there all the time taking photos of random crap. Easy: park on hill or broadway. Go to the fountain. If you don’t know the fountain, buy a lonely planet LA or something. Face what I assume is east (fountain on your left). Walk forward. You will cross a street and enter a plaza with a restaurant on your left that advertises a former proximity to Jackie Chan. Keep walking. Hit a building. Turn left, turn right, whatever. You are now on Chung King Road. Home of galleries and many a mean bargain du temps en temps. Also nice is the jukebox at Hop Louie’s, just SE of the fountain.